Hackers continuously spreading hundreds of millions of malware to steal the information and to corrupt the OS of the system. On the opposite, a lot of Antivirus company have been working hard to detect and quarantine the viruses. Still only very few Antivirus company providing 100% protection from the malware whereas remaining are lacking in some areas. Even Windows 10 contains built-in antivirus called Windows Defender but it cannot provide 100% protection. So everyone must have a best antivirus protection software to protect from all the exploits and prevents steeling of data and file corruption. 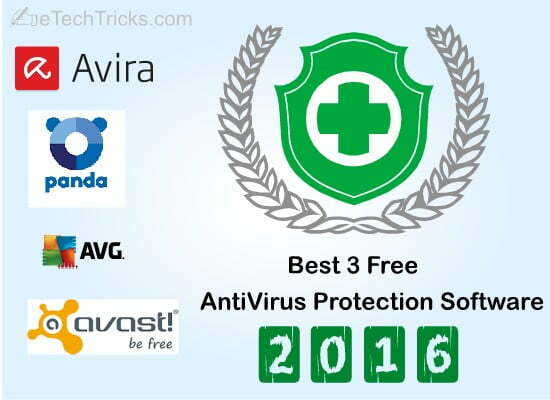 Avira is the No.1 free award-winning antivirus engine with light weight and easy user interface. It has real-time protection and real-time cloud scanning. More than 500 million users have been using Avira to protect their systems from malware. AV-comparatives confirms that Avira providing 100% protection in AV test 2016. Protects from all types of malware. Real time protection helps to detect and protect from malware before it attacks the system. 500 MB Free Virtual Private Network (VPN) to become you anonymize in the internet. Avira Scout: Safe browser to secure your bank details while banking and shopping online. Fully Compatible up to Windows 10, Android, IOS and Mac operating systems. Avast is the best alternative antivirus for Avira which gives same protection level for the system from virus, malware, hackers, etc. Avast failed in the file detection test conducted by the AV test. On July 2016, Avast announces that it acquires AVG antivirus which makes Avast to expand their users in large-scale. It has more than 230 million worldwide users and featured in CNet, Amazon, Softpedia and AV. Tools like browser cleanup, safe browser, free VPN, password manager, etc. has been bundled with the Avast Antivirus program. Provides safe browser for shopping and banking which stop hackers from stealing your bank information. User friendly and perfect for beginners. Avast software is a cross-platform which can be run in the Windows PC, MAC, android and iPhone/iPad and compatible from Windows XP SP3 to Windows 10. Panda is the best light weight and secured antivirus. More than 30 million customers in worldwide using Panda Security antivirus. Very light antivirus engine which has minimal performance effect and its task will not eat up your system resources. Light weight: Only acts as an antivirus without any extra bundled tools. All the actions will be performed in the cloud so there will be very minimal system performance effect. Perfect for beginners: A Default setting is suitable for the beginners so no need for any configuration post installation. Conclusion: Free AntiVirus Protection Software 2016? As we know, no one will give the best for free and there will be some disadvantages in the free items. If you are a normal home user and browsing in a secured internet, then the free antivirus is enough. But if you are looking for small business or you often deal with banking or handling confidential information then go with paid antivirus like Bitdefender or Kaspersky. Avira is good but sometimes Avira launcher might not start automatically. So I switched to Avast. Avast GUI is really awesome and I am using COMODO free firewall along with Avast Antivirus. Both doing good job.